A common story in the world of heating and cooling is that households tend to wait until their old system breaks before they install a new one. This typically happens on a cold winter day. There is an urgent call to the contractor who has an existing connection with the customer. The problem needs to be fixed, and fast. Under conditions like this, customers are likely to buy a replacement unit similar to the broken one. In Connecticut, where nearly 50 percent of residential space heating relies on fuel oil or propane, the default means more fuel oil boilers rather than a renewable alternative. But this isn’t always the story. 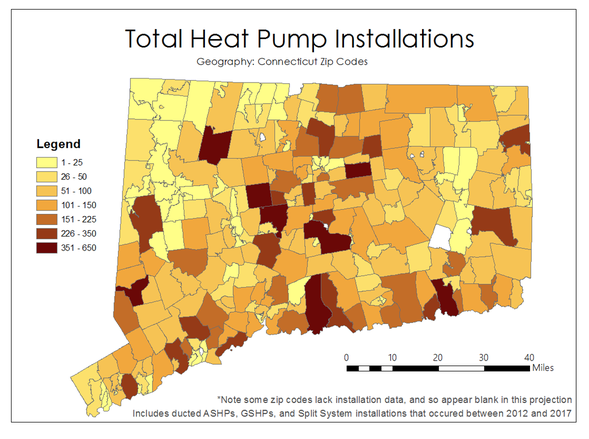 In the last six years, Connecticut residents have installed 16,200 heat pumps supported by utility grants. While the density of heat pump installations is generally low, there has been a slightly higher rate of installations in the most populous regions and in some rural areas (see Figure 1). heat pump installations. Illustrations prepared by Nathan Grady. To sort out motivations behind these choices, the “Feasibility of renewable thermal technologies in Connecticut” project asked residential customers about the factors that trigger the installation of heating and cooling systems. A web-based survey was distributed in the spring 2018 and resulted in 1,606 responses suitable for further analysis. This blog post discusses some findings from this survey. The primary heating and cooling system is used most often and typically serves the whole house. Figure 2 shows what tends to trigger the installation of primary heating systems. Figure 2: Triggers to installing primary heating systems. When major work on the house is due, customers seem to lump projects together. Replacing heating and cooling systems at the end of their useful life, particularly when combined with home improvements, follows a process of careful planning and consideration by homeowners. With regard to primary heating, this moment thus presents an important window of opportunity for promoting renewable alternatives. People moving to a new home present another important phase: Respondent households with a heat pump as a primary heating system noted moving as a significantly more important factor than households with other primary heating systems. 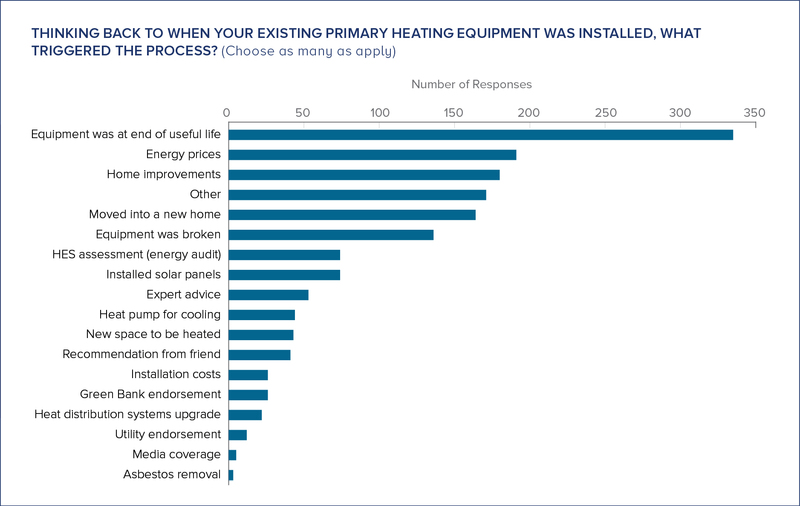 We asked survey respondents to estimate the age of their existing primary heating system as well as how likely it is that they will replace it (see Figure 3). Nearly a third of respondents indicated that they would definitely, or very likely, replace their primary heating in the next 5-10 years. Not surprisingly, this share increases with the age of the system. Fuel oil boilers dominate older systems while heat pumps used for primary heating are generally newer installations. 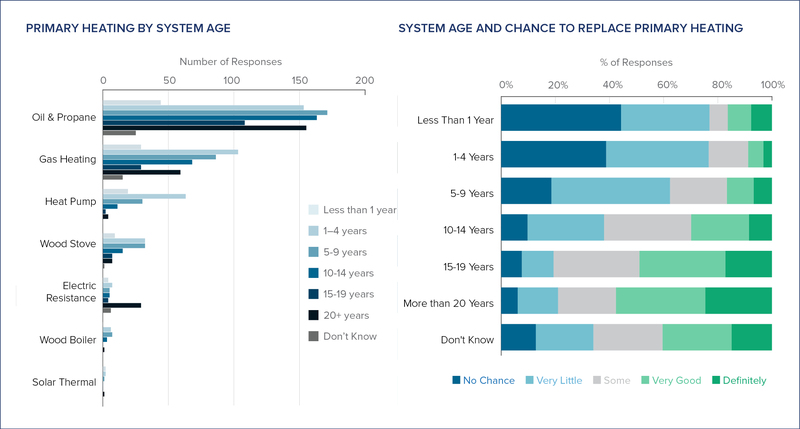 For households that have old systems but indicate little chance of replacement in the next 5-10 years, the explanation is most often “existing works well.” The second-most important reason is “plans to move.” Customers using an old system, independent of whether the reason is complacency or plans to move, are likely to have it break on them; and 18% of respondents indicate broken equipment as an important trigger for installing a new primary heating system. Triggers to install heat pumps may be markedly different than those to install other heating systems. Not only can heat pumps be designed for whole-home or single room services, they can provide cooling in addition to heating. Furthermore, there is generally a lack of awareness of heat pumps. In our survey, 17% of respondent households had never heard of them. The survey included 294 owners of heat pumps. Figure 4 summarizes the triggers for installing heat pumps. 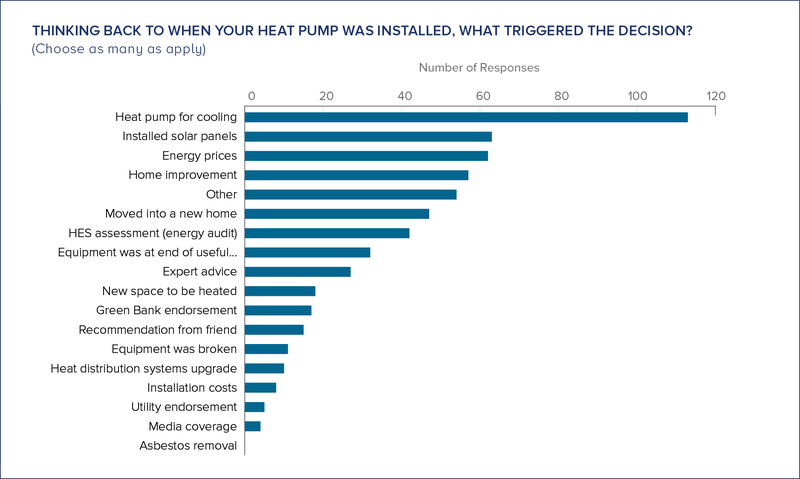 The need for cooling is the most common trigger in installing heat pumps, mentioned by 47% of surveyed heat pump owners. Installation of solar PV panels (26%) and energy prices (26%) are tied for the second most common trigger for adopting heat pumps. As it turns out, the share of heat pumps is higher among owners of solar PV (21%) than households without solar PV (13%). Since 2012, nearly 28,000 solar PV systems have been adopted in Connecticut. And given solar PV adopters seem inclined to pair their solar panels with heat pumps, utilizing structures of Solarize campaigns and engaging “Solar Ambassadors” may efficiently promote heat pumps. Although there is some truth to the “heat till it breaks” perception of the heating and cooling market, two of the main triggers for replacement of primary heating systems are the age of the existing system and other home improvements. This indicates that homes with old systems, as well as households in the process of home improvements, are most open to installing a renewable primary heating system. This is an important insight for expanding the use of renewable primary heating systems like ground source heat pumps, ducted air source heat pumps, and biomass boilers. The picture is more nuanced for heat pumps in general. Homes with newer primary heating systems may adopt heat pumps for cooling, to utilize solar PV installations, or to lower energy costs. These may be single-room or zone systems. Efficient marketing strategies depend on identifying the age of existing primary heating and cooling systems: strategies used to address homes with primary heating systems near the end of their useful life would differ from those used for homes with newer systems. For instance, whole-building renewable solutions could be attractive for homes with old systems, which represent around 30% of the market. The remaining market may instead be receptive to supplemental systems that provide additional value through energy savings and comfort. Campaigns and messages have to be tailored to these different segments and incorporated into a comprehensive, long-term effort to transform residential heating and cooling. Campaigns to encourage the adoption of ductless, single-room air source heat pumps among households with newer primary heating systems may increase general customer awareness of renewable cooling and heating options, priming further renewable-oriented customer choices down the road. Download the report with more detailed findings here. The Connecticut heating and cooling survey was distributed to residential customers in Connecticut that either 1) have received support to install solar PV from the Connecticut Green Bank, 2) have received support to energy audits (HES) from United Illuminating (UI) or Eversource, or 3) subscribe to information on energy efficiency and updates from the Governor’s Council for Climate Change. As a consequence of the survey distribution, the sample is not random and has a high share of solar PV owners compared to the general CT population.